Make sure you have the most up-to-date quality management information available! 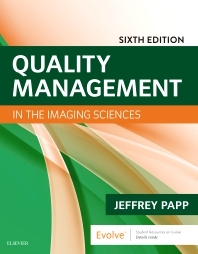 Quality Management in the Imaging Sciences, 6th Edition gives you complete access to both quality management and quality control information for all major imaging modalities. This edition includes a new chapter on digital imaging and quality control procedures for electronic image monitors and PACS, revisions to the mammography chapter, updated legislative content, and current ACR accreditation requirements. It also features step-by-step QM procedures complete with full-size evaluation forms and instructions on how to evaluate equipment and document results. The only text of its kind on the market, Papp’s is a great tool to help you prepare for the ARRT Advanced Level Examination in Quality Management. Special icon identifies federal standards throughout the text alert you to government regulations important to quality management. Includes QM for all imaging sciences including fluoroscopy, CT, MRI, sonography and mammography. Strong pedagogy aids in comprehension and includes learning objectives, chapter outline, key terms (with definitions in glossary), student experiments, and review questions at the end of each chapter. Step-by-step QM procedures offer instructions on how to evaluate equipment, and full-sized sample evaluation forms offer practice in documenting results. A practice exam on Evolve includes 200 randomizable practice exam questions for the ARRT advanced certification examination in QM, and includes answers with rationales.